Dwarkadhish Temple is the main temple at Dwarka, situated on Gomti creek, is known as jagat mandir (universal shrine) or trilok sundar (the most beautiful in all the three worlds). Originally believed to be built by Vajranabh, the great grandson of Lord Krishna, more than 2500 years ago, it is a glorious structure seeming to rise from the waters of the Arabian Sea. Its exquisitely carved shikhar, reaching 43 m high and the huge flag made from 52 yards of cloth, can be seen from as far away as 10 km. The grandeur of the temple is enhanced by the flight of 56 steps leading to the rear side of the edifice on the side of the river Gomti. The temple is built of soft limestone and consists of a sanctum, vestibule and a rectangular hall with porches on three sides. This region also known as Saurashtra. The Dwarka was the capital of Lord Krishna's terrestrial kingdom. The Dwarkadhish temple attracts thousands of pilgrims from different parts of the country and all over the world. The Dwarka of Krishna's time lies submerged under the Arabian Sea. 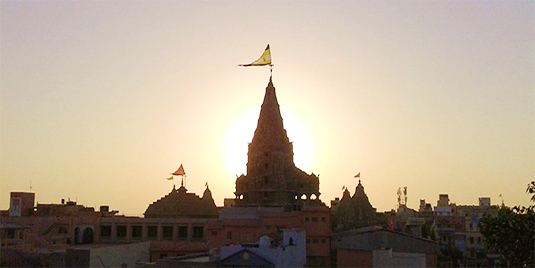 The Dwarkadhish temple is also known as Jagat temple, Hari Mandir. The temple has rich carvings. The temple Sikhar rises to 170 feet and flag of the temple is changed three times a day. The five-storeyed temple stands on seventy-two pillars. The temple spire is 78.3m high. From the temple dome waves an eighty-four foot long multicolored flag.